A couple of years ago we lost Caitlin. A family squabble over lunch in Cardiff Bay led to an act of defiance and our feisty little daughter marching out into the thronging crowds whilst we scrabbled after her. For a few, heart-stopping minutes, we couldn’t see her but luckily she hadn’t wandered too far. I can still remember the sickening lurch in my stomach as I realised she was completely out of sight and anything could happen to her. 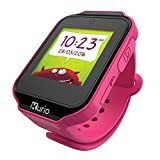 Which is why I was happy to road-test the dokiWatch, the world’s most advanced smartwatch for kids aged 6 to 12 which is both a wearable phone and a tracking device. If I had had one of these finding Caitlin would have been quicker and far less stressful. Whilst the jury is still out on the safety of kids using mobile phones and the inevitability of our children having them at some point continues to be a major point of parental discussion, the dokiWatch offers a kind of halfway platform which allows both child and parent the comfort that comes with being able to stay in touch. 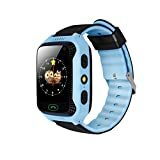 The dokiWatch is the first ever 3G enabled smartwatch for children and it has video calling, voice calling and messaging. Not only does it have GPS tracking but there’s an electronic ‘dokiPet’ which acts as a fitness tracker and awards achievement badges. To use the dokiWatch you need a Nano SIM with a voice and data service from your mobile provider. It is incredibly easy to set up – just insert the sim, turn the watch on and scan the QR code with the doki app. Voice Calling – parents and kids can call each other and you can also have a preset friends list when contacts can be called at the touch of a button (for example grandparents). Voice Messaging – parents and kids can send each other voice messages up to 30 seconds long. Text Messaging & Emojis – great for sending reminders to your kids. Emergency SOS Mode – a red SOS button on the side of the watch will send an emergency notification to designated contacts including 60 seconds of your child’s voice and any background noise. Smart Locator – you can track the position of your child on the doki app which uses GPS, GSM and WiFi to pinpoint their location. Alert Area – you can configure the watch to alert you when your child leaves a designated area. Classroom Mode – you can turn the watch off so that it doesn’t interrupt lesson. Caitlin and Ieuan took turns wearing it and loved the messaging function and being able to call me every five minutes with an update on their location. In turn, I could see their location on the doki app. The watch is bright, colourful and comfortable to wear. Ours was ‘Sonic Blue’ but there’s also Dazzle Pink, Shark Grey and Mango Yellow. I worried initially about the watch falling off when the kids ran about but it fits quite securely without being uncomfortable or irritating to the skin. It gives you the confidence of knowing where your kids are within a set radius and encourages a little more independence in your kids. Caitlin also liked that the watch is a bit of a head turner and attracted quite a few admiring glances! Nothing, in all honesty. For the less than tech-savvy, a basic ‘quick start’ guide would be a handy addition to the pack and our only other niggle was that the charging cable is magnetic and will fall off the watch if you knock it whilst it is charging. I would have preferred a charging cable that could be actually inserted into the watch. We gave our dokiWatch a thorough road test on our holiday in Devon and the only problem we had was that it was tricky to get the video messaging to work due to the poor signal in some parts of the countryside – a problem which afflicts all mobile devices. We had absolutely no problem with voice calling or messaging. 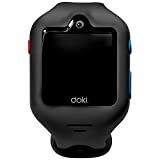 The dokiWatch is available from www.doki.com at $199.00. I’ll be keeping our dokiWatch charged and certainly ready for use on holiday and trips to town. We used a free pay-as-you-go SIM from GiffGaff which offers a data/call bundle for £12. Not all schools, of course, will permit the wearing of gadgets but given the number of parents I see speeding to pick up their kids on the school run, this particular one would be a great help when you’re stuck in traffic (again!) or, like me, have got distracted leaving the house and can’t find your keys! One quick call and you can let your child know where you are and tell them what you need them to do. 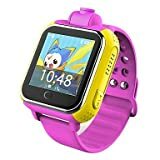 The only function the dokiWatch lacks is getting your kids to do what you ask. In which case, I fear we’re a few years off that yet. *a PR sample was received for the purpose of this post which contains an affiliate link. As of 20/08/2018 I can find no UK stockists, however, you will find similar models on Amazon.co.uk. "Beck Valley Book Tour: A Flair For Drama – A Sadie Kramer Flair Mystery By Deborah Garner"
I’m not to keen on obsessively tracking my children everywhere they go, but I do think this would come in quite handy at places like amusement parks and things like that. Not just for being able to find your younger children should they get lost, but also for slightly older children that you might want to let have a bit of autonomy and roam around on their own.